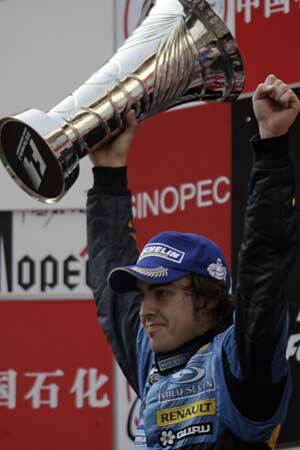 Fernando Alonso won his seventh victory of the year in Shanghai and by doing so ensured that Renault would finally win its first proper Constructors' World Championship, a goal the company has been chasing since it first entered Formula 1 back in the summer of 1977 when Jean-Pierre Jabouille first appeared at the wheel of a car they called The Yellow Teapot. It was a long and difficult route to the top but in the end, with a little help from British technology and a young Spanish driver, they got to play the Marseillaise. The victory was achieved against the odds, given the overall performance of the McLaren-Mercedes package, but when all is said and done, and the post-mortems are done in Stuttgart, Renault had a better package and deserved to win. It could have been a great year for McLaren but success slipped through the team's fingers like sand. China is a deeply frustrating place. There is so much potential and yet things do not run smoothly. Nowhere is this more in evidence than on the roads where the Chinese indulge in the nearest thing there is to automotive warfare with everyone, be they on a bicycle or in a truck driving at one another until one or the other gives up. Or they collide. Nothing is easy when you are a visiting foreigner. The Chinese wanted their Grand Prix to be the greatest in the world and they built a temple to the automobile, spending hundreds of millions of dollars to do it, but it was the detail that proved the most difficult thing to get right. Access was confused. Things were not easy. And so it proved with the race as a cheap piece of grating, torn loose by the power of the F1 cars flew up and was hit by Juan-Pablo Montoya, who has a habit of hitting things he does not need to. One would have thought that the Chinese might have learned from the mistake made last year when the Australian V8 Supercar came visiting and Mark Winterbottom went home with the bottom of his Ford Falcon ripped asunder by a loose grating. Making the same mistake twice - and being allowed to - is really not very smart but we can hope that the Chinese will learn and a do a better job in the future. Alas the mistake ruined the race. A danger was clearly present and the Safety Car was despatched. Alonso lost a 20secs lead but at the same time McLaren lost the chance to use a fuel advantage that they may have had. All the strategies went out of the window and, if the truth be told, so did the chance for this to be a great race. The field scrambled for the pits. Some arrived at the right moment and gained places, some arrived at the wrong moment and lost out. The order at the front was the same and we wondered if Kimi Raikkonen could come up with the same kind of fireworks we saw in Japan but it was not to be. The McLaren seemed somehow sluggish in the middle section of the race and then an accident involving Narain Karthikeyan - one of the biggest shunts we have seen this year - brought out a second Safety Car and once again it was a question of scrambling through. Some chose to change their strategies again and fill up and run for home. A handful gambled and for them it paid off. By then Montoya had disappeared into the garage with another Mercedes-Benz engine problem and while Raikkonen finally found his car coming alive beneath him, he knew it was too late. In F1 one must never give up hope and Kimi raced on, hoping that Alonso and Fisichella would break down but in the end one man can only do so much and the title slipped away. For Alonso it was a perfect run and there is no doubt that the pace of the Renaults caught out McLaren. Renault had everything to lose and nothing much to gain from taking risks but with two new engines in their cars the team had an advantage. The new engines had to run for only one race, half the distance of the engine in Kimi's car. After the race, Renault folk talked about lulling McLaren into a false sense of security on Friday and Saturday by running lower revs than normal to give the impression that Alonso was running light and Fisichella heavy. In fact the fuel loads were reversed and in the race, as Fernando drove way at the front, everyone expecting him to stop early, Fisichella was holding back, able to run much faster but playing tail-gunner for his team mate. The McLaren people thought that it was business as usual and did not worry about the situation. Perhaps that is true but we will never know because of the piece of grating, which messed everything up. Suffice to say that Renault did catch McLaren by surprise. Overtaking at Shanghai is not at all easy and so track position is as important as outright pace and in this respect Renault did it all perfectly. Alonso was never headed and with Fisichella protecting his tail in the early laps Raikkonen was never able to stay in touch. Normally Kimi would have got ahead of Fizzy at the first stops but the Safety Car ruined that plan and so Kimi remained trapped in Fisichella's wake. The Karthikeyan accident again disrupted any chance he had to catch and pass Alonso. As they headed into the pits Fisichella pulled the same stunt that McLaren had done at Spa, holding up Raikkonen and the rest of the field as almost everyone went into the pits. This allowed Alonso to gain an advantage and minimised Fisichella's own delay, waiting for Fernando to finish his refuelling and go on his way. Fisichella was delayed nonetheless and so Raikkonen finally got ahead and was up to second. Fisichella was later pushed back to fourth with a penalty for his behaviour. He said he did not understand why he was penalised as McLaren was not punished at Spa but all that proved was that he was probably not listening in the drivers' briefings (or was willing to risk it) because Race Director Charlie Whiting had spelled out that this was not acceptable behaviour and would be punished. And so it was, which allowed Ralf Schumacher to come home in an unlikely third position. Ralf was ninth on the grid, which became eighth when his brother Michael made a mess of things during the recognition laps as the cars were going to the pre-grid. The Ferrari star drove slowly across the road, clearly not paying attention, and went straight into the path of Christijan Albers, who was travelling considerably faster. The Minardi went into and over the Ferrari and both cars were wrecked, which meant that both men had to start from the pitlane in spare cars. Ralf gained from his brother's fallibility. At the first stops he gained places because Montoya, Jenson Button and David Coulthard were disadvantaged by their earlier stops and so Ralf was fifth during the second stint. Toyota then took the clever decision to leave him out after the Karthikeyan shunt and suddenly Ralf was second. Although he could not keep up with Alonso, Ralf was quick enough to pull away from Felipe Massa and Christian Klien who had gone for the same strategy and as a result of this Ralf was able to make enough ground before his pitstop on lap 47 to be able to rejoin in fourth place, ahead of the fast-fading Barrichello. And when Fisichella landed his penalty Ralf took the third step on the podium, a placed he has not visited much this year. With Fisichella fourth the minor placings were shared out between those who had taken advantage of the Karthikeyan crash and those who had been genuinely quick but unlucky. Klien was fifth from 14th on the grid, having gained six places by staying out during the second Safety Car. He gained another place when Massa pitted and scrambled out ahead of the Brazilian a lap later but had dropped behind Raikkonen and Fisichella. It was a good drive, a little fortunate perhaps but a good solid effort nonetheless. Massa was sixth which, given the poor state of Bridgestone tyres in the second part of the race, was a decent achievement. Mark Webber was all over the back of the Sauber in the closing laps but was unable to pass. The Australian had been one of the unlucky ones during the second pit stops and might have benefited from staying out behind Ralf Schumacher. The final points went to Button and Coulthard, the victims of the first Safety Car who ran fifth and sixth in the early laps but ended up eighth and ninth through no real fault of their own. Michael Schumacher ended a poor day with an embarrassing departure, spinning off while running behind the Safety Car on lap 23. "This weird ending pretty much sums up our season," he said. "I spun simply because my tyres were completely worn and they were very cold, so when someone braked ahead of me, I had to brake as well and went off the track. Actually, I am not sure I would have finished the race because of the condition of my tyres. The only positive thing is that I am third in the championship." Michael went home with a reprimand from the stewards for the Albers incident. His Ferrari team mate Barrichello gained a decent advantage during the first Safety Car period but after the middle of the race his tyres were shot to pieces and he went backwards to finish 12th, just behind Tiago Monteiro's Jordan, the best of the Bridgestone runners. Monteiro's team mate gave everyone a scare with a huge crash. "I don't know what happened," he explained later. "The car was on the artificial grass and it sucked me into the wall. It was a big accident but it could have been worse." On Monday morning Karthikeyan was going to have a very sore neck. Jacques Villeneuve had a dull day to finish 10th, losing several places with an incident behind the first Safety Car. Antonio Pizzonia should have finished 11th but retired on the last lap with a puncture and so finished 13th. The less said about Takuma Sato the better. The Japanese driver jumped the start and was duly sent to the back of the class by the teacher in Race Control. He made up some ground and then lost some of it by sliding off and eventually retired with a gearbox failure. "This is a fantastic feeling," said Alonso as the champagne began to flow at Renault. "I didn't think anything could equal winning the Drivers' Championship, but seeing our people celebrating, it's just as good! I am really so happy today." As the party broke up everyone was happy to be going home after a long, long season. By March next year the batteries will be recharged and we will be off again.